When I prepared my introduction to The Blog Fantastic, I had some authors and series in mind. Books that I knew I wanted to check out or revisit. Some of those have been a pleasure to discover or reread. A few of the books I revisited or tried out where disappointments. One of them I didn’t even finish (consequently I didn’t review it either). The flip side of these disappointing books is that there are others books that pop up on my radar and inexplicably jump to the top of my reading pile. Even better, some of those books I enjoy. Jim Butcher Storm Front, the first in his Dresden Files series, is such a book. I’m not sure where my interest in this book came from, but it’s a good fit. There was a distinct lack of urban fantasy in The Blog Fantastic archives. For those who aren’t all caught up in the Dresden Files craze, they’re a pretty clever combination of private detective fiction and urban fantasy (or paranormal fantasy). It’s a good mix, but something has made this particular series very popular even in comparison to other similar series. I don’t know why just yet, but I’m sure I’ll find out if I keep reading past the first book. Let’s start with the setting, Chicago, the windy city. This is the home of Harry Dresden, a wizard for hire which means he’s essentially a private detective for hire and he specializes in cases that deal with magic. One of his regular clients is the Chicago Police Department, most often the Special Investigations Unit. In Storm Front, Dresden is hired by a woman to find her husband who happens to be a novice magician. That same day, he receives a call from Lieutenant Karrin Murphy, his main contact at the Special Investigations Unit, to consult on a brutal murder in which magic is suspected to have played a role. Lately, there’s been a lot of criminal activity related to a drug called ThreeEye which allows normal humans to see the world as wizards would. From there, things continue to escalate and become more complicated. Seemingly separate plot threads are linked together and the deeper Dresden gets in his investigations of missing husband and the murder case, the more he’s attracting attention to himself from the most dangerous people in Chicago and elsewhere. The plot, especially in the beginning of the novel, follows along with PI genre conventions. Everything sticks to that and it works pretty well as a way to ease the reader into the more magical aspects of the book. The novel itself becomes more enjoyable once the spotlight pulls away from some of the noir trappings, but that never goes away entirely. And it shouldn’t. That’s part of the formula, that’s part of what makes this enjoyable, but too much of it is a little tiresome, especially at first. Really the worst thing about this is Butcher’s unsuccessful attempt at mimicking the writing style of classic detective fiction. Some of the writing techniques used in detective fiction, like the point of view and Harry’s narration, are used successful. They’re a great way to give the reader additional information on aspects of wizard life and explain some of the rules of magic. That’s actually some of the most engaging stuff in the book. I don’t particularly like Harry, at least not yet, but I do find him pretty interesting. The magic was enjoyable for the most part. At times very specific. There are universal laws that you must remember when working up a spell, yet those laws allow for quite a bit of flexibility in the specifics. Consider the potions that Harry and Bob (an air spirit who lives in a skull in the sub-basement of Harry’s apartment) prepare. The specific ingredients are less important than the essence of what those ingredients represent. What also factors in is the kind of person for whom the potion is meant for or the general usage you have in mind for that potion. Things can be tinkered with to achieve different results. The magic reminds me a little of the way it’s used in Grant Morrison’s The Invisibles. It’s more about the ritual and the belief in what you do, rather than how you do it or the ingredients that are used. Another aspect of the magic that I enjoyed is that it’s something that requires careful preparation and planning. It’s not all flash bang and wand waving. That Harry Dresden manages to be quick and effective with his magic, often improvising on the spot, makes him a rather interesting and believably skilled wizard. He’s obviously a powerful wizard and I look forward to seeing him use his magic in different ways in future volumes. I’m mostly pleased that Butcher avoids having Dresden tell us how awesome he is without giving the character opportunities to prove it. I can’t write a review of Storm Front without mentioning the pacing. It’s very quick. I literally devoured this book in three short sittings. It’s pretty clearly a page-turner. The mysteries and the way the magic is related to the book’s main plot (rather than something tacked on for flare) makes the book more enjoyable and exciting than it otherwise could have been. I’m not the kind of person to like mash-up stories for the sake of them being mash-ups. I’ll admit, some ideas just seem to work well together, and private investigators and magic might be the kind of ideas that are destined to work well together. Still, you need something extra to make that kind of simple association of ideas interesting and engaging. Butcher put together a formula that works. From the first person point of view, to the private detective specializing in the occult and working for the Chicago Police Department, the way the magic is intertwined with the plot and how it’s gradually explained as the story moves along, it all contributes to giving this book a breakneck pace. All those elements come together quite well and Butcher makes sure that the story doesn’t get lost in the genre trappings. There is one thing I borderline hated in the book: the characters. They were downright awful in some parts and there are numerous cringe worthy scenes. First off, the book has recurring passages of misogyny. It stands out because it’s unfounded in the story or the characters. I’m not sure if the private detective genre influenced Butcher’s writing, but it’s almost as if he’s trying to play with the Femme Fatale archetype and doesn’t manage to do so successfully. I’m not sure he understands the use of the Femme Fatale in noir fiction or PI novels but you can see attempts at it here that simply don’t work. I think I’d have a hard time writing that kind of character too, because they’re usually very complex. Instead, the women in Butcher’s book often show stereotypical characteristics of weak women. It makes for some unpleasantness while reading. It doesn’t help that the main character admits to being a chauvinist. I guess it can appear to be a joke or sarcasm-filled narration, but only if you hold the book at arms’ length and squint a little. Combine this with the awfully written female characters and the result is a book that feels as if it was written during the same decades as some of the classic of detective fictions because it posits opinions that feel awkwardly dated. Even with his deplorable attitude towards women, Dresden is rightfully the most interesting character in this book. That’s not to say he couldn’t benefit from more development because as it stands, I think he’s a good wizard and that’s about it. Well, that’s not entirely true. He makes up for it by the end of the book when he repeatedly demonstrates that he’s the kind of person that will stand up for what he believes is right. He’ll even defend that selflessly but it might come off as selfishness because he’s got a knack for being very irritable. I might be willing to concede that he’s a nice friendly guy but he makes terrible first impression. 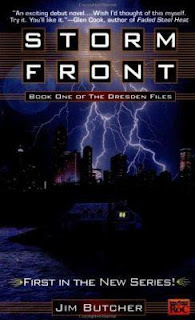 Even with the noticeable problems, I enjoyed my time reading Storm Front and I think it’s a decent introduction to what I’m told is one a great series. If nothing else, I see the potential here for an immersive series of novels by a skilled writer. That being said, the prose is workmanlike, but it certainly shows promise. What makes this book memorable, however, isn’t the writing, or the plot, or the characters. 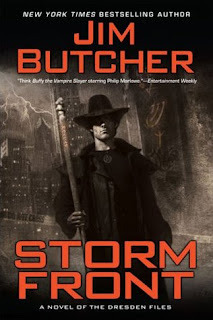 It’s the small details that help to build the world of Dresden Files and get the reader interested not only in the ongoing narrative of this book, but in the larger storytelling threads that Butcher sprinkles throughout. For me, this was the kind of book that I picked up solely based on its reputation and I’m glad I did. It’s the kind of book that you read quickly and some of the details stick around with you a while as you think them over. The characters, the tone, even the magic system are all familiar and it’s not too difficult to trace their sources and Butcher’s influences. Still, Butcher manages to give everything a distinctive flavour, a unique perspective. I’m not blown away by Storm Front but I’m interested at the possibilities of what the sequels could make of this series.